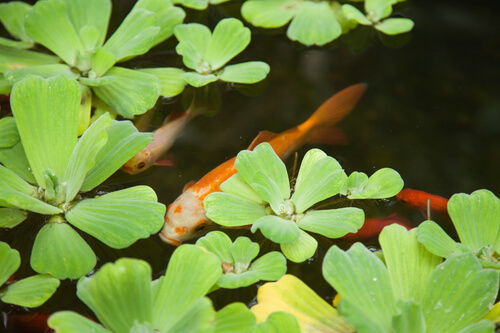 Adding different aquatic plants to your pond is an amazing way to make your water garden looks even more beautiful. But first, you need to make a plan how you are going to put in the right aquatic plants at the right time. Otherwise, it may look like an aquatic jungle! First, you need to consider what type and how many plants you are going to use. There is a wide range of pond plants in the market that you may find overwhelming, but you need to make the right choice for your water garden. So, you have to spend some time gathering information about the specific requirements of each plant you are interested in buying. There are many aquatic plants in the market, like floating plants, water hyacinth or lettuce. These types of special and beautiful plants develop extensive roots under the surface, and they also provide shade to aggressive algae growth in a pond. You can also choose to buy submerged plants, like hornwort and anacharis. These plants can improve the quality and clarity of the water. Or you may prefer bog plants, like iris or cattails that can surround the perimeter of your pond. You may also choose lotus and water lilies, which can give your ponds amazing colors and various underneath shades. Of course, you can select to buy a mixture of all these plants, to make your pond look marvelous. Remember that it’s better to cover about 60% of the water’s surface. To do so, you can select 6-12 floating plants, two bog plants, some water lilies, and several submerged plants. Also, you have to buy also fertilizers and containers like plant bags and pots. You will love to use them, to take care of your pond. Which Type Of Aquatic Plants Are You Adding? Floating Plants – Place them in the pond, and they will freely float on the pond surface. Submerged Plants – Grow them underwater in plant bags and fill your containers with planting materials. In fact, you can plant several bunches of these plants together. Bog Plants – These plants grow better in containers under the water pond. Lillies/lotuses – These amazing aquatic plants can thrive in pots. To transplant them, fill out the tub with clay, and then you can put some planting media on the top. If you would like to see your new aquatic plants blossom, you will definitely to need various nutrients for your plants to have lovely blooms. So, make sure to buy some aquatic plant fertilizers, like spikes or tabs. For example, fertilizer spikes release plant food slowly over a period of 12 months. On the other hand, you can use a spike in a simple way: You just have to put them into the soil, and you don’t have to do anything else for the whole year. If you put water plants in the pond, ensure you consider their special needs. Wrong water plants will ruin the water pond beauty and make it useless. On the other hand, choosing the right water plants will add a magical touch of shape, color and texture to the pond.